The couple have managed to create a successful sandwich shop business despite neither of them having any previous experience in the industry, although they did receive full training from the streat head office team. Mrs Slattery said: “The training was excellent and thorough. At no stage did I think that if I asked a simple question I would end up feeling silly. From the first morning in the hotel in a strange city, Amanda my trainer arrived to walk me to the training centre so I would know the way in the future. This small gesture made such a difference to me. “I never realised there was so much to learn about opening up a café. 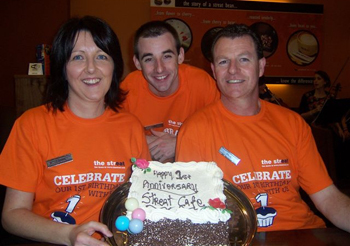 I still laugh to myself when I recall telling people that I was going up to Belfast to do a four-week training course to open a café franchise and their expression said it all. I could only imagine they were thinking; why is it going to take her four weeks to learn to make a sandwich? But I can verify that there is a lot more to it than that.